We had a bit of fun in the office this week comparing certain modes of transport to Premier League footballers. There were several calls likening Chelsea midfielder Eden Hazard with a Jaguar E-type as they both ooze class. Someone compared Arsenal defender Per Mertesacker to a cruise ship, as it takes him an age to turn, and Manchester City midfielder Raheem Sterling was described as a Bugatti Veyron for his blistering speed. 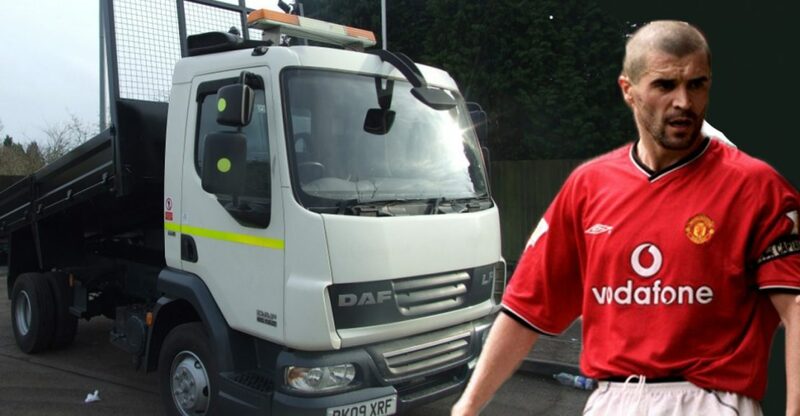 But which star of the pitch would you associate with the humble tipper truck? There was a unanimous result … former Manchester United ace Roy Keane. The tipper truck is undoubtedly the hard man of the road. It doesn’t matter how tough the job is, it just rolls up its sleeves and gets it done. The tipper truck takes no prisoners and doesn’t seek any plaudits. Just like Keano, it simply wants to do its job and do it to the best of its ability. Tipper trucks are seriously tough vehicles. They are made for transporting heavy loads, but they do it so effortlessly that you can be excused for overlooking their importance. If you are looking for a vehicle to transport tonne after tonne of rubble and other aggregates then the tipper truck is the one for you. It doesn’t matter if you are moving rocks, soil or potatoes, there will be a suitable body for you. Most people in the construction business will opt for an all-steel body. This is the strongest frame around. Unfortunately it will result in a reduced payload and hinder its fuel efficiency. However, those working in landscaping will often choose a more economically friendly option. A bonded resin tipper floor and aluminium sides presents much better fuel economy and won’t damage the vehicle as much. Tippers come in both front and rear wheel drive and the wheelbases can be either short or long. You also have a choice of single or double axels alongside a range of cabs, standard, sleeper and crew. It doesn’t matter where your allegiances lie, there is no denying that Keano was a phenomenal player and a born winner. The tipper truck is exactly the same. It doesn’t matter what job you throw at it, the tipper will always get the job done. We also have a huge stock of scaffold trucks, beavertails, boxvans and more so for all your used trucks, get in touch.